“Art involves the expression and communication of human experience, so that if we did decide that it is the computer which is generating the ’artwork’, then it cannot be an art work after all”. (from M.A. Boden, Creativity and art: Three roads to surprise, Oxford University Press). 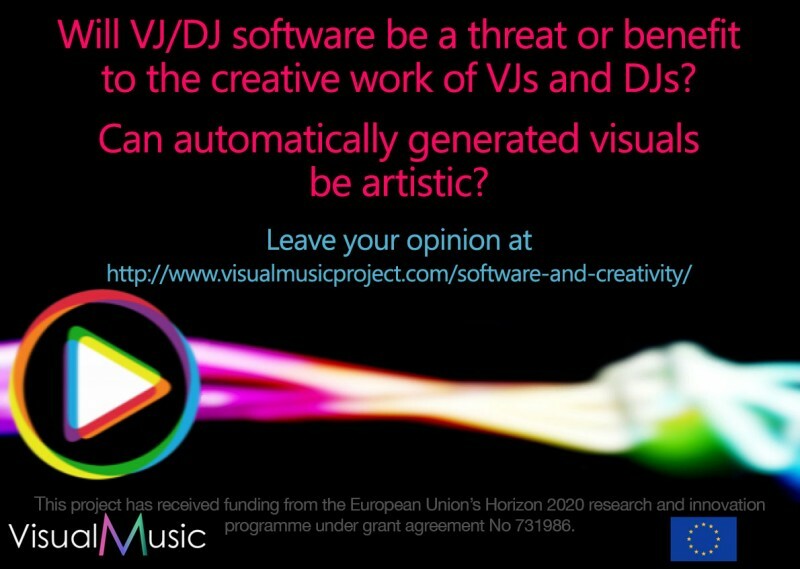 A few months spent interviewing VJs and DJs about VisualMusic software made it clear that one central theme around which opinions and distinctions gravitate is ‘art’. The issue of the artistic value of live music and visuals is recurrent in our data, along with questions about the role that VJ software plays in improving or decreasing such value. Indeed, concerns about the fate of the artistic dimension of VJs’ work could generate some principled resistance towards the adoption of VJ software. Since VisualMusic goal is to provide VJs with a satisfactory, empowering tool, the University of Padua team devoted the past months to delve in this issue and sort out a few points. A new round of interviews has then started asking questions such as: How can technology help an artist to be creative? How can we avoid that software automation and ease of use lower the standard in VJ art? Does art need to be intentional? Do customers always appreciate the artistic quality of a show? Anybody who feels to have something to say about this and wants to save the research team from major blunders can leave a note in a dedicated forum at www.visualmusicproject.com/software-and-creativity … it won’t get wasted! The automatic mode will be just an option for those places where there’s no VJ. The main use of VisualMusic will be creative, designing and producing the 3D animations and interacting with them in real time.